To celebrate the centenary of the birth of RS Thomas, eleven poets have chosen a poem of his and written a poem of their own in response. 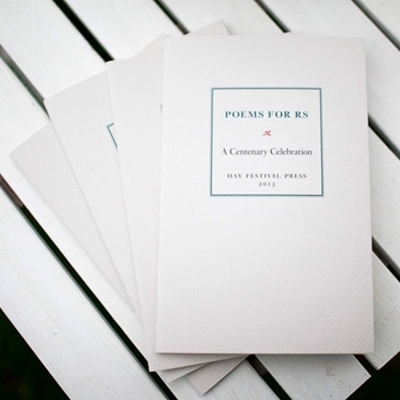 The collection is published as a limited edition by Hay Festival Press. The volume includes poems by Simon Armitage, Gillian Clarke, Damian Walford Davies, Grahame Davies, Menna Elfyn, Mererid Hopwood, Anna Lewis, Emyr Lewis, Glyn Maxwell, Eurig Salisbury and Owen Sheers. Hay Festival Press was set up a few years ago to publish beautiful limited editions of short stories by writers including Margaret Atwood, Louis de Bernières, Hanif Kureishi, Elif Shafak, Doris Lessing, Michael Morpurgo, Owen Sheers, Jeanette Winterson, DBC Pierre, Rose Tremain and Ariel Dorfman. The profits support our Hay Festival Education Fund which contributes to the access programmes we run at Hay Festivals around the world.